This was the basic motive of our product. The router was connected with the solar energy, this power supply will never become an issue until the sun itself fades away from the sky. The multiple radios lead to the auto machine networking and the algorithm used helped us to make 0 percent configuration to set up. It also had a decentralized server to provide offline content service to the user. As all of us know, networking has been cited as the number one unwritten rule of success in business. With this, we started to implement our product. Various routers were placed in various areas of a chosen village. One router was provoked to connect with the internet in the nearby city and then this internet connection was transmitted to other routers in the village and finally, the village was enlightened with the internet. 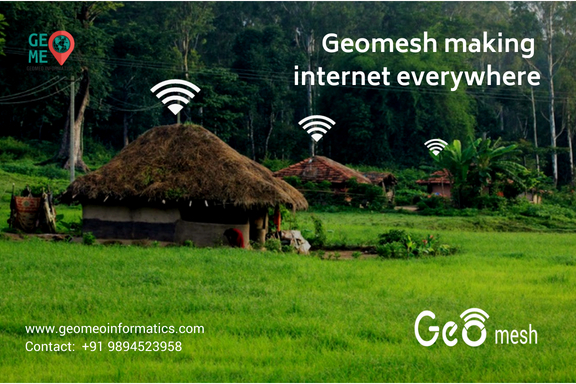 We chose Bhavani Island and provided the access to the internet which deployed 2000 mesh nodes in India. It’s always tough to go on with a wired network which includes breakage and fragility, a wireless network is much more effective and productive than a wired one. We also partnered with UST global which is the largest service provider to organize government exams in villages. The transportation for the village people becomes easy and effective. With these implementations, we witnessed the village student’s excellence in exams. Also, 60000 new internet users bloomed. So we contributed the best of us to the backward parts of the state and helped them to walk in the running internet era. It is a world first wire-free modular, multi-radio wireless mesh router specially designed to provide connectivity in remote rural villages where alternative access either doesn’t exist or is too expensive. The node has a powerful CPU/GPU which is capable of running blockchain powered decentralized offline applications. Geomesh is a wire-free router which means that the router has a solar charging support with long lasting battery backup. It allows making it more portable. It is modular which means that the router expands its functionality by supporting more addon. Every node can be configured as to do different functionality other than expanding the coverage such as peer to peer security camera, public radio, distributed cloud storage, sensor node. It has multiple radios which operate on 2.4 GHz, 5 GHz, and optional 60 GHz band. The effective utilization of spectrum allows providing a seamless long-range connectivity. It supports an auto-configuration of mesh networking between the nodes. By adding more nodes, you can expand the coverage to the entire village. It completely avoids the Wi-Fi dead zone. All these nodes have powerful CPU/GPU allows running the blockchain based decentralized application. All the communications are peer to peer. It gives the highest security for your data. The nodes come with storage support with cache facilities. The entire system can run without Internet connection which gives offline internet support to users. The major problem that we face is that the internet is very essential to gain knowledge and share the knowledge with others. But 57 percent of the world’s population does not have access to the internet. Only 47 percent of the population is connected with the network. Any Internet service provider faces the technical challenges to provide the internet connectivity in those remote regions. Wired connections are fragile. It leads to high maintained cost. In a nutshell, the GeoMesh is an indoor/outdoor weather-proof 3-radio wireless mesh router. Using its two 5 GHz radios and sector antennas, the GeoMesh automatically forms a mesh network with another Geomesh router within range. Using the 2.4 GHz radio, it creates a hotspot around it for its clients to connect to the network, and the resulting mesh network enables communication between all the devices connected to it. Moreover, if any router on the local network connects to other networks (such as the Internet) all devices on the local network automatically gets the access to the internet through the mesh. It also allows a multi-mesh environment, where each mesh is an administrative boundary (like a neighborhood, a community, a building). Each mesh can relate with the others easily, including peering (allowing users of each network to reach the other network) and transit (to get to other networks through one of your neighbors). YES, WE CONNECTED WAS OUR PRIDE.